The KeeGuard guardrail system provides permanent, free-standing and durable edge protection without penetration of the roofing membrane or the building structure. The hot-dipped galvanized finish is corrosion resistant and low maintenance for safe and dependable rooftop edge protection. KeeGuard’s galvanized steel finish is corrosion-resistant and is available in a full range of powder coat RAL colors. Our 11°Angled Railing tilts back out of sight so the roof line offers a clean view from the ground. The Physics of Cantilever Design. Modular and durable, our component-based solution uses counter-weight engineering. The simple cantilever principle provides unrivalled strength and safety. The heavy-duty KeeGuard bases are manufactured using molded, 100% recycled PVC. Each 30 pound base is positioned at specific intervals to create a stable, protective barrier on the rooftop. Download the KeeGuard Brochure HERE. A smart solution for standing seam and metal profile roof systems. Maintain building aesthetics with cantilevered and foldable guardrail. Modular safety rail provides a secure barrier around tight areas. Free-standing and portable for temporary installations. 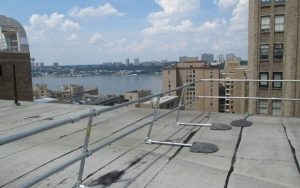 The modular components of the KeeGuard Fall Protection Railing System typically allow two installers to install a 600 foot run in 8 hours once all the materials are on the roof. Position a KGU. Connect the counterbalance assembly, CB5 to the KGU upright with the 44' long 1-1/4' pipe and tighten the set screws to 29 ft/lbs (39 Nm). Slide the Schedule 40 1-1/2' galvanized pipe through the fittings at the top and at the mid section of the uprights to form the rails and tighten the set screws. Connect the lengths of handrail together using Kee Klamp® fitting Type 14-8 (Straight Coupling) and tighten the set screws to 29 ft/lbs (39 Nm). Be sure to always stagger the joints of the handrail between bays. At 90° corners, use Kee Klamp 15-8 (90° Elbow). Ensure that an upright is no further than 20' from the corner, and that the total length between uprights around the corner is no greater than 6' 6'. 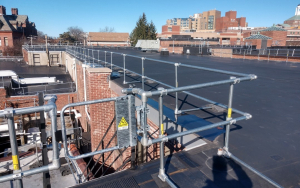 Summary: Provide and install freestanding KeeGuard Roof Edge Fall Protection System, including pipe railings, uprights, bases, counterweights, fittings and delivery to site. Reference: OSHA: Regulation 29 CFR 1910.23 (e) (1) ; (e) (3) (iv), OSHA Regulation 29 CFR 1926.502 (b) (1) - (b) (14), all applicable state, local and regional codes. Pipe for handrails, mid-rails, uprights and counterweight connection is to be galvanized mill finish to the requirements of ASTM A53. Kee Klamp® Fittings shall be galvanized to meet ASTM A153. Railing shall consist of top rails, mid rails, uprights, counterweights and connections. All pipe connections to be Kee Klamp structural pipe fittings manufactured to the requirements of ASTM A47-77-32510. Railing assembly shall be capable of withstanding a load of at least 200 pounds applied in any direction at any point on the top rail. Test in accordance with OSHA Regulation 29 CFR 1910.23 (e) (1) ; (e) (3) (iv). Shop drawing: Indicate profiles, sizes, connections, size and type of fasteners and accessories. 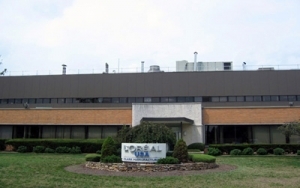 Verify field measurements prior to assembly and/or ordering. 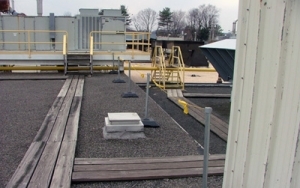 Kee Safety, Inc., Buffalo, NY, USA - P: 800-851-5181, F: 716-896-5696 - http://www.keeguard.com, Model: KeeGuard Roof Edge Fall Protection System. Pipe: ASTM A53 1-1/2 inch schedule 40, galvanized. Rails and Posts: 1-1/2 inch diameter steel pipe, galvanized. Kee Klamp fittings: Elbows, Crossovers, Wall flanges, Tees, Couplings, galvanized. Fasteners: All Fasteners shall be 304 or 305 stainless steel. Fit and shop-assembled components in largest practical sizes for delivery to site. Assemble components with joints tightly fitted and secured with set screws tightened to 29 foot pounds of torque. Accurately form components to suit installation. For all connections with Kee Klamp fittings, each set screw is to be tightened to 29 foot pounds of torque. Placement of uprights and counterweights to meet manufacturer specifications as stated in the KeeGuard Installation Instructions. Terminate the run as stated in the KeeGuard Installation Instructions. 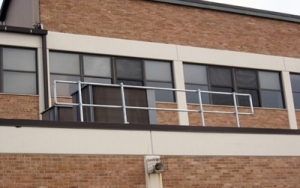 Freestanding counterweighted guardrail system with 42" nominal height to provide a pedestrian egress barrier on the roof which withstands a minimum load of 200 lbs. in any direction applied to the top rail per OSHA: Regulation 29 CFR 1910.23 (e) (1) ; (e) (3) (iv), OSHA Regulation 29 CFR 1926.502 (b) (1) - (b) (14). Acceptable low slope, roof edge fall protection to be KeeGuard, manufactured by Kee Safety. Are toeboards available on the KeeGuard system? Yes, a toeboard can be supplied at the customer’s request. Can KeeGuard be used as an anchor? 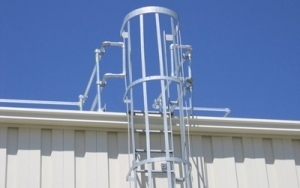 The KeeGuard system is not intended as an anchor and cannot be used as an anchor or tie off point to support any workers or equipment suspended off the roof. Can the KeeGuard system be painted? KeeGuard components can be painted by the customer before or after installation. KeeGuard components are also available powder coated in any RAL color at the customer’s request (extra charges apply for powder coating). Powder coating takes place prior to shipment. Can the KeeGuard system be used to protect snow removal workers on rooftops in cold climates? Does the KeeGuard system comply with the current US safety regulations? The KeeGuard system has been tested to comply with, and exceed, all US & OSHA codes. Does the KeeGuard system offer advantages over a horizontal life line system or harness system? Yes. KeeGuard Roof Edge Fall Protection Railing System is a passive, collective fall protection system which is preferred by safety consultants. Lives have been lost in work related falls resulting from workers not using harnesses properly. The KeeGuard system removes the potential of that risk. Harness systems require training and proper and regular use. The embedded anchor for a harness system could later leak and cause costly water damage. The worry of not enough harnesses for rooftop workers is eliminated. How do I buy the KeeGuard system? Each KeeGuard System is individually engineered for your premises. For further information, call the US (1-800-851-5181) or Canada (1-877-505-5003) to speak to our KeeGuard sales desk. Is KeeGuard more expensive than using a Harness/Tie Off system? The installed cost of KeeGuard is competitive with horizontal life line systems. Is KeeGuard required by law? Building owners and employers are responsible for protecting their workers from any hazard encountered while on the job. In jobs requiring access to roofs for maintenance purposes, fall protection is usually required if workers will be exposed to a fall hazard. Will installation of KeeGuard reduce insurance premiums? Insurance premiums are often impacted by steps taken by the building owner to reduce hazards to their workers. More importantly, building owners’ liability will be strictly examined if an industrial accident occurs and preventative measures (such as KeeGuard) were not taken. Can the KeeGuard system be installed on a sloped roof? The system can be used on any style of flat roof with a slope up to 3 degrees. How long does it take to install KeeGuard? Are special skills or tools required? With the use of the new KeeGuard open style fitting (standard), two workers with minimal experience and simple hand tools can be installed up to twice as fast as most other systems. 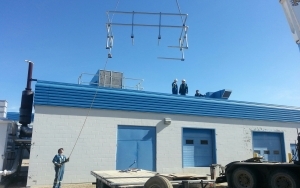 All materials should be delivered to the rooftop using a hoist, crane or other mechanical method. No power tools are required. Is KeeGuard intended for temporary or permanent installation? 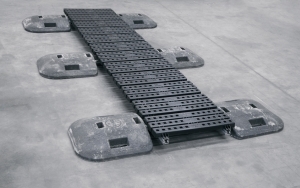 The system is intended as a permanent fall protection solution, however since it is a modular system, the system can be disassembled and moved if needed or for maintenance tasks. Are all the materials used in the KeeGuard system protected from corrosion? Galvanized pipe is used for vertical, horizontal and counterbalance supports and Kee Klamp fittings are all galvanized at our factory. The grub screws used to assemble the fittings and pipes together are all protected by Kee Koat® which is a special corrosion resistant coating. 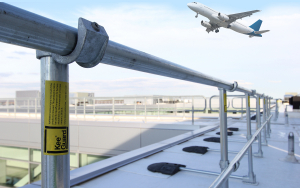 KeeGuard fall protection system is engineered using special fittings and is designed to withstand a full range of outdoor conditions. How does the KeeGuard system stay on the roof if it isn’t bolted through the roof membrane? 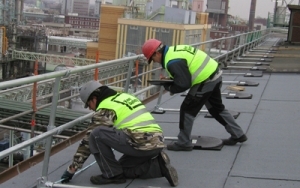 The system employs a tested and proven counterbalance system, the KeeGuard system (Patents in effect) is a roof edge railing fall protection system that keeps the workers on the roof without endangering the roof membrane itself. 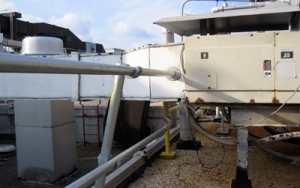 What prevents the counterweights from sinking into tar/gravel roof surfaces in hot climates? KeeGuard Permanent Fall Protection, KeeGuard Contractor Temporary Fall Protection, and the KeeGuard Skylight Railing have been independently tested and meet or exceed all relevant North American and International Safety Requirements. Find certification documents in the documents section.